Continuing on with yesterday’s theme of “meals I ate a long time ago and didn’t tell anyone about”, let’s take a visit to Dallas. I was there back in November with my friend Jack for two days. On the first day we arrived in Dallas at 4 in the morning and had to camp out in a McDonald’s before we could hire our car. Then we went to the George W. Bush Presidential Library at Southern Methodist University (beautiful building, just a shame about the content) and the JFK memorial and Sixth Floor Museum at Dealey Plaza. Knackering day, as I’m sure you can imagine, so we really wanted a corking meal to congratulate ourselves on a day of touristing done right (apparently touristing is a word). Help us Guy Fieri, you’re our only hope! I’ve made my love of Diner’s Drive-ins and Dives well known over the past two years. The sheer enthusiasm Guy Fieri brings to the table, the quality (and portion size) of the food, the whole American-ness of it all; adore it. I browsed a wonderful website called Flavourtown USA which has a list and map of most of the locations that Guy Fieri has visited, at least in the early years of Triple D (it has it’s own nickname). One cropped up that looked interesting: Avila’s, a family run tex-mex restaurant about a 10 minute drive from our hotel. As soon as we walked through the door I knew I’d seen it on TV. Very familiar décor. It’s basically like someone turned the two reception rooms of their house into a restaurant, which effectively is what happened. This was by far one of the most fulfilling meals of the entire trip! It was Margarita night (which we both enjoyed), and as soon as you sit at your table you get a bowlful of hot nachos and a selection of dips and guacamoles to dig into. 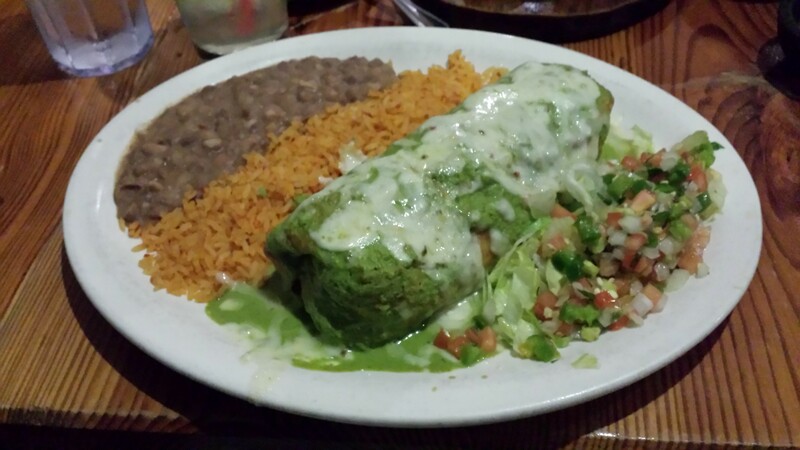 I went for the chicken and spinach chimichanga, which I think was a special that day. You can see it in the image above – it was huge! I’m not a huge fan of hot (spicy) food, so this was a delight. There was so much cheese inside and on top! The rice and chilli that came with it were marvellous. A real treat. 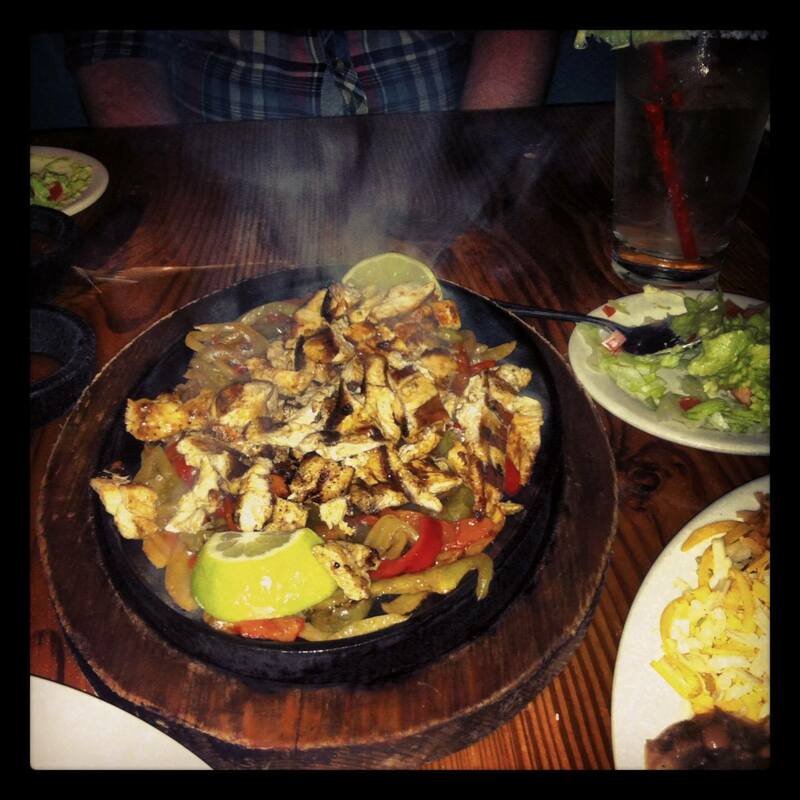 Jack went for the chicken fajitas, which sizzled out of the kitchen all the way to the table. Mmmf, what wonderful food. I mean, look at it below. How can one man eat all that? If you’re ever down in Dallas, you can’t not go to Avila’s restaurant. Hands down the best Tex-Mex, Tex or Mex food I’ve ever eaten.